As the consumers that we are, how would you feel if you bought a product that claimed it was authentic, when it was in fact a lie? In a WSJ article published this past Friday reported on the dissatisfaction and in this case of some, deep aggravation, felt by Walmart customers across the country. 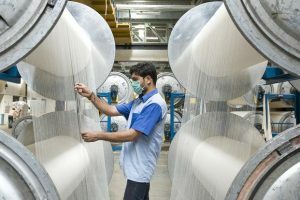 Walmart recently discovered that the ‘Egyptian Cotton’ Sheets, made by a company called, Welspun of India, were not that well-spun after all. Shortly after this discovery was made, the company issued a statement that this incident was “unacceptable, resulting in all customers receiving a full refund. All unsold sheets will be donated. A similar situation happened at Target, also with Welspun, resulting in all sheets pulled from the shelves and Target cutting all ties with them. What Walmart did differently in this issue is not cutting complete ties with the company. Instead they will collaborate with the company to “implement strong controls and better label the products they supply”. In the previous class, we talked about the key themes and takeaways from Chapter 3 in the textbook, such as corporate social responsibility and citizenship. This article shows the complexity of this topic. First, both Walmart and Target responded with concrete action to refund their misled customers, and by removing the mislabelled sheets avoided further mistakes. However, if you are a prospective sheet-buying customer, would you not prefer to shop at Target, rather than Walmart, where you know all their vendors have a perfect history of selling the true thing all along? Why should Walmart customers not remain suspicious of vendors like Welspun and their tainted track records? It seems Target found the best way to balance the integrity and authenticity of their products, with their accountability to their customers to sell them product that are true to their descriptions. These are clearly the higher goals of capitalism. At least, they are higher than the goal of simply making a buck.